Some artists, as they say, need no introduction. 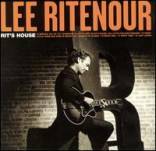 Lee Ritenour is such an artist. He’s back with his old label GRP for “Rit’s House”, his zillionth solo album. Module 105, a Ritenour composition, bobs gently along, driven by Vinnie Colaiuta’s crisp snare drums and Marcus Miller’s unmistakable bass. The guitar is pure gold – Ritenour gets a joyous chirp from it that I’ve rarely heard equalled. Beautiful. Acoustic bass underpins the oh-so-cool 13. This swings gently and, believe me, the Gary Grant, Jerry Hey, Bill Reichenbach brass triumvirate sounds fabulous here. John Beasley’s Rhodes solo is a delight too. Delicate percussion opens Gabor Szabo’s exotic Mizrab. It’s a pretty melody which gets some funk injected by Marcus Miller. George Duke’s Rhodes solo is restrained but it’s pure Dukey. Flying jazz drums, deft bass and the classic Hammond B3 sound of Joey DeFrancesco make 78th and 3rd a slice of timeless jazz. With tight horns and Ritenour’s sweet semi-acoustic this will delight listeners who thought no-one wrote or recorded “real jazz” any more. Mix me a Martini before the song’s over! The title track is a mellow, bluesy and very groovy tune. The horns again sound sassy and fabulous and this must be sublime live – I can imagine a classy set opening with this. A Little Dolphin Dreamin’ is wistful and pretty. Ernie Watts blows sweetly and there’s just that nice “Hill Street Blues” feel to this song. Prepare to be surprised. Some covers of Police songs fail to capture the elegance of the original. Michael Macdonald turns in a superb performance on Every Little Thing She Does is Magic. The instrumentation is subtle and this is an impressive interpretation. The lazy but still funky groove of Condor features the other-worldly tenor of Ernie Watts and it’s driven by the chunky bass of Melvin Davis. I love this! Exotic Indian flutes open the quirky Olinda. Rhythmically it’s very subtle and takes a while to get into. Whisper of guitar, a mellow upright bass and the hint of B3 – this is the smoky, bluesy Night Owl. Ernie Watts is restrained and tasteful. This stuff gets under your skin – Rit plays jazz. Things keep rollin’ on Party Time. Jerry Hey’s muted trumpet and Watt’s tenor double up and strut into this cool number with piano, guitar and sax solos to follow. Bartender – another bourbon over here! The wistful Just Listen closes this classy set. Drums, bass, piano and guitar are played with such finesse that it defies belief. If it sounds familiar, maybe you heard the version on Bob James’ “Grand Piano Canyon” – it’s gorgeous. In the liner notes, Lee describes this project as “one of my most enjoyable to work on” and it’s for sure that surrounding himself with some of the planet’s best musicians must have been a high. Lee’s fans will know that he’s used to that though – ultimately it’s his songwriting and guitar artistry that make the difference. And on both fronts, Rit’s never sounded better.